Padayani is a Devi temple ritual from Kerala. The word Padayani comes from the word Pedani which means military formation. So, is it a celebration of war heroes? Well, yes and no. No, because it does not celebrate any human war. Yes, because it celebrates the victory of Goddess Bhadrakali over the demons that come in various shapes and forms. Some of them within us and some outside us. Padayani is actively practiced in Central Kerala, mostly in the Bhagwati or Bhadrakali temples located on the banks of Pampa River. Traditionally, it used to be practiced for as long as 21 days or nights. Nowadays, it is mostly done for 7 nights or 3 nights. Sometimes, it is also crunched into a one-night performance like the one I witnessed. Padayani they say involves the knowledge of all 64 artforms (64 Kalas) mentioned in the Shastras. I could not wait to see the ritual on the last day of my Kerala trip. Devi Bhadrakali takes birth to kill the demons like Daruka who cannot be killed otherwise. In her Raudra or angry incarnation, she kills the demon. After killing, she is still raging with anger. In this state, she went to Kailasha – her father Shiva’s abode in the Himalayas. Her anger must be pacified. So, Shiva and his Bhootganas wear masks made of leaves and dance to live music and sing songs to pacify her. Even then she does not get pacified. Then she sees her fearsome form drawn on the floor as Kolam and that amuses here. It is believed that first Kolam was drawn by none other than Karthikeyan. This is said to be the beginning of the ritual of Kalamezhuthum. Padayani is performed to re-create this event of pacifying the Bhagwati or Bhadrakali. Dances are performed in rounds called Kolams. Each Kolam has a prime dancer. One of the Kolam even has Shiva as a dancer. Ritual typically ends with Bhagwati or Bhadrakali doing a peaceful dance & blessing everyone around. Padayani interestingly was initially practiced by Ganaka community or the medicine men of Kerala. It was probably a way of psychological or spiritual healing. Another section of experts says that Ganakas were practitioners of Martial Arts. 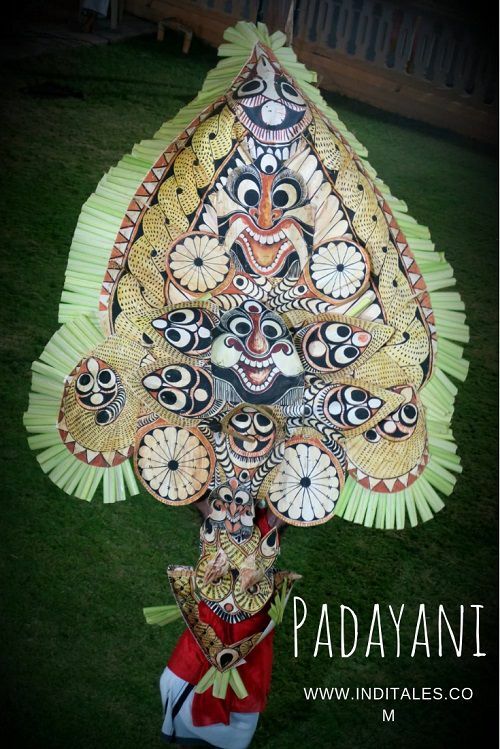 We do see the glimpse of martial art in the performances of Padayani. It is performed primarily from November to April. Different villages follow different calendars for the ritual of Padayani in their temples. My first rendezvous with Padayani was to get a glimpse of mak making for the evening ritual. The Padayani team spent the day in a large hall converting the various parts of Arecanut tree to create the fresh masks in the hues of green color. Some of these masks were so elaborate and so big that I wondered how would someone wear them. It was a pleasure to stand at one end of the room and see the hands moving swiftly to create and decorate the masks. The big masks were making their presence felt by their sheer size, but the smaller ones were as attractive. Then, there were pairs of eyes, jewelry and other paraphernalia that was scattered around. Later I would see these going on a performer like pieces on an assembly line. You would never know how they would finally look until you see them all on a person. Deep Red and Black colors are used to paint the green leaves. Painting brings out the emotion of the masks, most of which are furious. These masks transform a human being into the forms they depict – be it the demons or the Devta’s or sometimes even a clown to entertain. Masks are known as Kolam and the original art form was called Kolam Thullal. This essentially means dancing with the masks. Just like Kalaezhuthum, different activities involved in Padayani are performed by different communities. While the Nair community performs the Padayani it is the Kaniyar community that creates the elaborate costumes with leaves. The ritual of Padayani involves a lot of action and a lot of people. So, it needs a large space. At Amrita University, where I saw this ritual, a whole central courtyard of the university was the space for the performers. We the awe-struck positioned ourselves in the surrounding corridors. The ceremony started by bringing the ceremonial fire to light the lamp. The lamp would remain the center of the ceremony for the rest of the night. Men in white and red Vestis started dancing around the lamp slowly and in rhythm to the tune of music being played at one end of the ground. A group of musicians plays the music and another group sings the Bhagwathi songs. Thappu – a kind of percussion instrument is the main instrument played at Padayani. In fact, some sources say that the ritual begins with the heating of Thappu called Thappu Choodakkal. Other instruments used are Chenda, Para, Kumbham, and Kaimani. Dancers moved around the lamp, and slowly their movements gain momentum. The movements became more complex almost getting into a trance-like state. The dancers would go and a person or persons wearing masks would come and perform. The two are sometimes interspersed by a dialogue. Everything works like clockwork as if this is what these artists do every day. The rounds of dances are called Kolams, yes, the same word that is used for masks. Each Kolam has a different story to tell and a different myth to present. Ganapati Kolam – Usually depicts the birth of Ganesha & I believe the first Kolam to be performed. Yakshi Kolam – the demi-goddesses and they can be both benign or evil. Kaalan Kolam – the God of Time or Death for Kaal denotes both. Kaalan Kolan actually tells about the story of sage Markandeya who had a short life. With his devotion to Shiva, he got his life enhanced. Read the full story of Markandeya Rishi in our post on Kurukshetra. This is the most important Kolam and is usually performed by the master artists themselves. Marutha Kolam – goddess of smallpox, appeasing her eradicates the disease. She is supposed to be the reincarnation of Mandodari – the wife of Daruka, whom the Goddess killed. It is believed that as Mandodari she sowed the seeds of the small box in Kali’s body and as Marutha she cures it. Bhairavi Kolam – Goddess in her fierce form. She performs the last and her mask is made of 101 areca nut leaves. Each Kolam has a different and its own well-defined mask that is worn by the performer. In between dances and Kolams, few verbal exchanges take place. A jester-like character takes center stage and has a dialogue with the singers. I could not gather the conversation, but the tone told me it is a satire potentially on a current topic. The banter I am sure added to the entertainment factor of Padayani. These satires come as a part of Manushya or Pardesi Kolams during the Padayani performances. Towards the end, there was a tree created by joining the branches of a live tree. One of the artists climbs the tree and jumps off from it. There is a lot of running around like running across in jungles. Finally, one of the performers broke a lot of coconuts lined up. I assume this was a kind of sacrificial practice that is now done by breaking the coconut. This coconut would be finally given to us as prasad. A welcome thing early morning as I was famished. In the end, the Bhagwati comes and dances. The mask was taller than the person wearing it. While I admired the dance I also admired the energy levels of the troupe as it never went down through the night. There is a lot of fire throughout the ritual. The last mask o Bhagwati holds a fire stick in front. It was 4 AM when the ritual came to an end. Surprisingly, I was not sleepy. The energy created by the music and the vigorous dancing was too vibrant to let anyone think of sleeping. As we drove towards the Trivandrum airport, I wondered if it was a dream that I saw or I really sat through the entire night watching this strange mix of art, culture, spirituality, tantra and the human spirit. I came back and read a bit more about Padayani. Happy to learn that since 2004, there are efforts being made to revive Padayani. Young men are being trained in the art forms required for performing Padayani. A village called Padayani is proposed to be developed. I think it would add another feather to Kerala Tourism if done well. For more information on Padayani refer to the works of Prof Kadammanitta Ramakrishnan or check out more on this website. Thanks for explaining to us readers that the Padayani art form as performed in Kerala today (and going back several centuries) involves (1) the knowledge of all 64 artforms (listed in the Kamasutra); (2) that it was practiced by the Ganakas (medicine men) who practiced psychological or spiritual healing and also taught Martial Arts that form part of the performance of Padayani; (3) that the rounds of dances called Kolams narrate a specific story as part of Padayani. Maadan Kolam, for instance, has a theme of protecting the cattle where the dancer is said to have the prowess to kill the potential russler with his shadow; (4) that Vinodam (satire) on some hot current topic is interjected in between dances and Kolams involving a vidushaka (jester) like character who takes center stage and engages in a dialogue with the singers. This account of Padayani reminds me of Bharata’s Natyashastra, which traces the origin of ritual dance-dialogue-drama (that is being performed since Vedic times and later elaborated in the Shatapatha Brahmana) to the dialogue between Pururavas and Urvashi in the Rigveda (10:95.1-18) featuring (and prefiguring) the seeds of the above four components of Padayani. Thank you, Sir. We are trying to share the joy of our travels and discoveries with readers, in the process of bringing people together. Interesting to learn about Padayani.